Well, Easter has passed us by, we’re well into April, and it looks like we’re done with the snow for another year. Yes, Spring is here, and nice weather is well and truly on its way. Perhaps you’re already enjoying it where you are, but here in Chicago, Winter is just a little more stubborn. We suffer through months of bitter cold and piles of snow because, when the summer weather finally comes around, you just can’t beat it. Clear blue skies, low humidity, a gentle breeze off the lake, gorgeous sunshine, and enough public parks to enjoy it all stretching from Evanston down to Indiana… is it any wonder we cast off our heavy coats and run outside at the first inkling of warmth? In honor of the lovely temperatures expected (finally up to 60° for a few days in a row! ), this week I give you sandwich rolls. Personally, I think the best way to enjoy fine weather is to call your friends, get some food together, and meet up in the park for a picnic – and I think most Chicagoans would agree! Other than fried chicken and Champagne (and if you know me, you know I’m not joking), what better picnic food could there be than a sandwich? Easy to make, transport, and eat while holding your plate down in case of a breeze, sandwiches are endlessly versatile, and can be customized to meet anyone’s preference. This week, I’ll be talking about rolls for any kind of sandwich filling, rolls that will certainly make your picnic the envy of anyone within smelling distance. Aside from a deep-dish stuffed pizza, one iconic Chicago food is a type of sandwich you might not even consider when thinking of a sandwich: the Chicago-style hot dog. After all, what is a sandwich, but some filling in between two pieces of bread? And in Chicago, hot dogs are far more than simply a frankfurter on a sad, squished bun. Like that surfeit of a pizza, the Chicago deep-dish, the Chicago-style hot dog is an overabundance of ingredients; it is the hot dog turned up to 11. You will find any number of Chicagoans more than willing to debate any one of these toppings, and the merits thereof. I’m sure there are people who would sooner cut a finger off than eat a hot dog with tomato slices, instead of wedges (and vice versa). Personally, I’m not a fan of sweet pickle relish (or anything else dyed that neon hue, for that matter), so I’d leave it off mine; but I’d probably get someone sadly shaking their head at me in pity. What I’m trying to get at is that people in Chicago take their hot dogs very seriously. The base of the whole “dragged through the garden” mess is that poppy seed bun. However, if you live anywhere outside of the Greater Chicagoland Area, they can be hard to find, if not downright impossible. And those poor little naked hot dog buns you find in their place just don’t have the strength to defend themselves agains such an onslaught of topping. 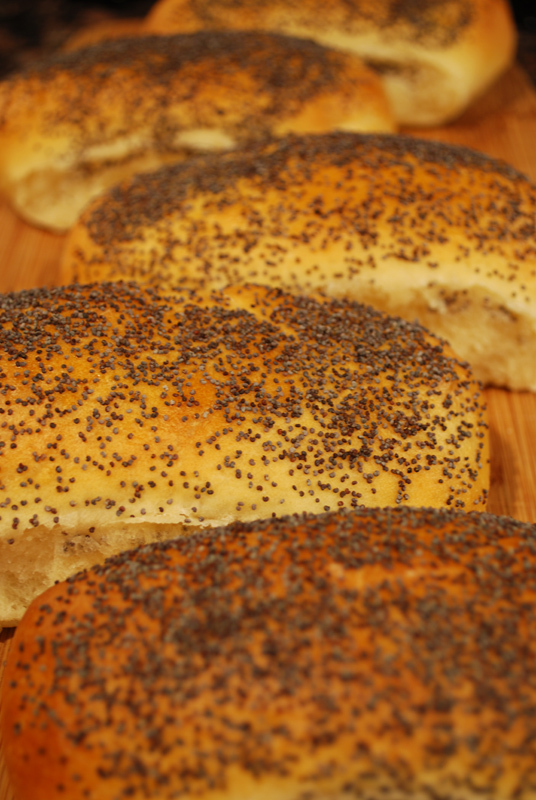 If you find yourself longing for a proper Chicago Dog, you’re going to need a proper poppy seed bun. These buns are soft and slightly sweet, but have the necessary fortitude to hold up their end of the deal. So for all you dispaced Chicagoans who haven’t seen a proper hot dog in ages, this one’s for you. Make up a batch of these rolls, boil a batch of the best beef hot dogs you can find, call all your friends over, and laugh at anyone who dares ask for the ketchup you threw out just before everyone got there. One bite, and they’ll be eating crow along with all those other toppings. 1. In the bowl of a stand mixer, stir the sugar and warm milk together until the sugar dissolves. Sprinkle the yeast over, stir, and let stand until foamy, about 3 to 4 minutes. 2. Reserve a handful (about 2 to 3 ounces) of the bread flour. Add the remainder, the cake flour, and salt to the yeast mixture. Using the dough hook, mix at low speed until a dough forms. Add the butter in pieces, until incorporated. Scraping the bowl down as needed, increase the speed to medium-low, and knead for 6 to 8 minutes. Add the reserved bread flour by tablespoons if necessary to form a smooth dough. The consistency should be soft and relaxed, but not too sticky and wet. 3. Transfer the dough to a lightly-oiled bowl, turning to coat all sides with oil. Cover with plastic wrap, and let rise in a warm place until doubled in size, about 1 hour. 4. Punch the dough down, and let rise a second time until doubled again, about 1 hour. 5. Line a large baking sheet with parchment paper. Turn the dough out onto a clean, unfloured work surface. Divide the dough into 18 equal pieces. Shape each piece into a small ball. Covering the dough not being used, roll each into an even rope 4 1/2 inches long. Do not taper the ends, to make sure the buns are shaped properly (the dough will rise higher in the middle than on the ends). Place each rope on the prepared baking sheet, flatten the top slightly by pressing down on it, and cover loosely with plastic wrap to prevent a skin forming on the dough. For crisp-sided buns, place 2 to 3 inches apart. For softer buns with soft sides, place them 1/2 inch apart. Cover loosely with plastic wrap and let rise until almost doubled, about 45 minutes. 6. Preheat the oven to 400° F. Brush the tops of the buns gently with the egg wash, taking care not to deflate them, and sprinkle with poppy seeds. Bake for 20 minutes, or until golden brown on top. Remove to a wire rack to cool. Slice horizontally, and fill with a beef hot dog, yellow mustard, sweet pickle relish, diced raw onions, two tomato slices or wedges, a pickle spear, pickled sport peppers, and celery salt. And no ketchup, ever! 1. You can, obviously, leave the poppy seeds off if you like; but then, it wouldn’t be a Chicago-style hot dog bun, would it?